Please scroll down to read some of the many testimonials from people who have attended one or more of Fr. McAlear's Healing Masses or retreats. "A few months back I had asked for your prayers for my cousin who had non-Hodgkin’s Lymphoma. He is cancer free. Fr. Mac Please continue to pray for him that the Cancer never comes back." “I am trying to contact you to send you some information regarding the healing mass you did a couple of years ago in ... Our family attended this mass and had an absolutely amazing experience. Our daughter, ..., was diagnosed with a kidney disease 5 years ago. We attended the healing mass that you held. The mass was extremely powerful and I truly felt that we went for ... but I came out healed. You came up to me and grabbed my head..and honestly my life and mind changed. Gone was my worry, gone was my stress, my mind as a mom was healed. However, slowly (my daughter) kept getting better! Against everything we had been told to prepare for! 18 months ago (she) was taken off all meds, because she had met her allowed time on them. As the meds were lowered slowly..(she) IMPROVED!! On Monday we went to Cincinnati to see her nephologist..her Dr stated that for some reason she believes (her) body healed itself!!! She said she feels there is less than a 5% chance that (she) will EVER relapse! Going to the healing mass was a big decision. As a mother, I wanted my children to see our faith in EVERY situation God hands us, however, I did not want them to think that God wasn't listening if He didn't heal her. The homily you gave was all about healing..and how ALL of us need some form of healing. As you spoke I knew I made the right decision attending because your words were not about medical healing (however, I do believe a medical healing took place!). F"ather McAlear, I attended your healing Mass last year. At the time I did not feel that I needed healing. I had read the testimonials and wanted to attend the Mass to see “faith”, to know that God is here on earth. I did go up for a blessing and you asked me a question about why I came and I gave a “nervous” answer “to see you”. I attended another service conducted by you. I did need healing in my soul but have been struggling with sadness, forgiveness, and guilt. I went to visit my priest before the Mass and he gave me your book on “Forgiveness”. As I read the book each page seemed to be written for me. I implemented the teachings and immediately felt better. I made the decision right then to attend your next healing Mass. The night before the Mass I went to bed like a child the night before Christmas knowing that Jesus would help me. I was not certain of the results or how I would feel leaving the Mass, but I knew that Jesus would be present and things would be OK. Words cannot describe the peace and happiness I felt after your services. My life changed in many good ways. I had been on anti-depressants for two yrs and was in a very unsettling marriage. I no longer take the anti-depressants and my marriage has improved. I felt the Lord's presence working through you, it is always a blessing to be at your Mass. The gentle generous love of God and His Holy Spirit speaks to us through your ministry. Thank you for praying over us. We came away with lasting peace and joy and an assurance Jesus had healed whatever we needed to be there for that night." "I had a smoking habit for 50 yrs and tried many times to quit. On Oct 2009 we had a special healing Mass and all weekend I asked God to remove my bad habit and surrendered everything in my control of smoking to God. After the Mass, Father had a special anointing for those who cared to receive it. My friend and I witnessed several people falling back as they were anointed. I have only seen this happen on TV and thought it to be part of a show ordeal. I asked my friend if we should go up and get anointed and she replied to me that she was also kind of scared and I said, “Don’t worry, that won’t happen to us”! My friend was first to be anointed and I saw her fall back. Before I could say anythingFather anointed me and I fell back. All I can say I remember was that while I was laying down I had my eyes half open but only saw white and nothing else. I felt tears streaming down my cheeks and could hear church organ music. I am not sure how long I laid there but I can say that was the most peaceful feeling I have ever experienced. I started to sit up and cry when I heard someone say to me, “It’s alright to cry.” I started to sob uncontrollably, how long I have no idea! When I stood up my friend and I hugged each other and went to sit down crying and wondering what had just happened! As I got into my car, I reached for my pack of cigarettes that laid on the seat. I opened the box, took out my lighter and cigarette, looked at it, put the lighter back in the box, closed the lid and put it in the glove compartment. Now, 2 years later, I have not had even a desire for a cigarette! My husband still smokes but not even once have I thought that I want to smoke. What a Miracle. I praise the Lord daily. I know that it’s only through His grace that I was cured." "Your visit changed me and I want to sincerely thank you. The committee that brought you to ... were the last to receive a blessing from you. When you walked up to me and raised my chin to look me in the eyes, I saw the face of Jesus Christ. It keeps coming into my mind and and puts a smile in on my face and in my heart." "My mother in law received healing last night at your mass in .... About a week ago a CT scan showed interstitial lung disease, a progressive and fatal condition. By the grace of God, I stumbled upon your book on healing prayer and then our first miracle, I saw you were here in FL this week for healing mass! My mother in law is a devoted Catholic and we know God arranged for this special meeting. After service you anointed her with oil and prayed. Today she had a doctors visit to review additional tests and the doctor found no sign of lung disease. He gave her a breathing test and her results where perfect! He compared it to one she had two years ago as part of a standard screening and it was better today than before she ever had any known issue! You are such a blessing to our family. There simply are not enough words to describe how grateful we are for Father McAlear!" "After your Healing Mass on September 12th in Tewksbury, my friend Alice's leg wound was miraculously healed overnight. It shocked her, her family and her doctors." "You are amazing father McAlear. Ever since we met in Syracuse my head pressure has been gone. I continue to keep you and your health in my prayers daily. It's a beautiful thing what you do through our Lord." I reached out to you about a month or to ago in regards to my mom ... who was diagnosed with colon cancer that spread to the liver. I just wanted to thank you SO MUCH for your prayers. I'm happy to say that her blood tests have improved dramatically and almost all levels have returned to normal and all her symptoms have completely disappeared. She has 3 treatments left, so we are praying so hard that God blesses her with continued healing and remission at the end of this. Her improvement has been so inspiring to us. Thanks again Father. Your prayers have been a complete blessing and I will never forget it." My friend Rick in Port Orange, FL told me how your prayers helped heal his heart disease. "My husband, my sister and I attended your healing mass last May. We drove up from NJ. I was diagnosed with Idiopathic Pulmonary Fibrosis last December, a progressive terminal lung disease, source unknown. Your healing mass was a very intense experience where I sensed a quiet shift, a glimmer of hope. At my doctor appointment yesterday, where I had many pulmonary tests, I was told my statistics were phenomenal, actually almost at normal levels, and my heart rate and oxygen saturation perfect. Besides the prayers, rosaries and novenas, I firmly believe God has healed me through you. Thank you, Fr Mac"
I had a healing at the mass on May 26th. I was totally blind for 6 weeks 60 years ago from TB meningitis and regained perfect accuity with very restricted visual fields. For the past 20 years, I have experienced a substantial decrease in my vision with no explanation. On the way home from the mass on the 26th, I noticed that the road and signs looked clearer to me. My husband and I stopped at the grocery store and while he was picking out a dozen eggs I could read the name on a can of parmesan cheese, something that I haven't been able to do for a few years. Things looked different to me, clearer to me. When I woke up the next morning, my sight was back to the way it had been but I didn't lose faith. The following morning, Saturday, I woke early and turned and saw that it was 5:00 on my husband's alarm clock. I have not been able to see that clock for 4 or 5 years. There is definitely an improvement in my vision. I feel like there is "peace" in my eyes. I thank you for your ministry and will keep you in my prayers." for me because I actually believe that Jesus loves ME. WOW There are no words, just gratitude." "I want to let you know that when I was prayed over at the healing Mass last week, all the pain in my back left me. The back surgery which was scheduled for this week has been canceled. Besides all that, my depression has lifted. Thank you and thank God for His grace and healing love,"
"We had an awesome experience with Father McAlear in Belleville Il at Our Lady of The Snow Shrine. For myself it was a very moving experience. A couple weeks after seeing Father my wife ... had a CAT scan and her tumor has gotten smaller. She has now finished chemo therapy and will be starting a maintenance drug in January." "I have had this cyst on my right wrist for a long time. The night I came home from the Healing Mass, ... the relative who lives at my house was complaining about a lump on the back of his hand. I said " does it look like this cyst on my wrist?" And I turned my wrist for him to see. Amazingly it was completely gone! Now when I told my daughter about it she said "mom, those cysts come and go". I responded "remember when you had your heel operated on, you were about 12 years. I asked the doctor about it then. That was 22 years ago. He told me just to live with it so I have. I had asked Jesus to take it away so many times due to my vanity. It was just kind of a thorn in the flesh just because it was ugly. But I figured I had lived with it for so long I got used to it. It just disappeared the night of the Healing Mass!" You may remember me, probably don't among all the great ppl there - but what you said to me as you prayed over me has stuck with me these weeks after that Mass. I have to admit, I felt really nothing as you prayed over me, and I felt nothing much as I went back to my pew, but, I had a new awareness of the need of healing in my soul. I guess I actually knew it was there before I proceeded to come … to meet you, but it was something I didn't know how to deal with or fix so I have shoved it down for 29 plus years. My update is such that in the two weeks following your mass, I read your book on Forgiveness. The exerpts, most especially about St. Paul, made me aware of some things that were blocking me from being able to forgive the ppl closest to me …. I participated in catholic counseling services for over 7 years, and while it was a huge help, I never had closure or maybe I should say, complete forgiveness. I have been in a cycle - forgive - be mad - forgive - be mad - I had lost my peace and I didn't know how to get it back. AFter your Mass and after reading the book on Forgiveness, I reached out to God in a way I guess I haven't before because I received a response that was new. It was like I went to bed one night after my prayer and the next morning and everyday and every moment since that morning, things have been different. I have a peace like I have not known before. I have a sense of losing myself and my hurts in return for something much bigger - the love I have always wanted to share with my family but have not allowed myself to do it because my hurts and anger made me so defensive. That is gone. I have had to change slowly with …, I don't want them to think I went to heaven already and came back - but that' kind of how I feel. Just wanted to tell you that. And THANK YOU for sharing the gifts God has bestowed upon you. I attended two of your Healing services in Lowell last spring. I felt such a peace both times. I was there to receive a healing for my son who was diagnosed with a rare form of brain cancer. He is scheduled for a Petscan on October 6th. I pray everyday for a complete healing. Please remember my son Joseph Clark in your prayers." "Thank you for your prayers, God has answered all our prayers! Joseph's scans came back clean." "I wanted to send a testimony to share to Praise God for my healing to be shared with everyone . I have had chronic pain for 8 years, taken narcotics, nerve pain medications and sleeping pills . Repeated surgeries , local injection and therapies, nerve blocks were all ineffective. I was praying for a healing priest , and found Fr. McAlear and that he was coming to Long Beach . After he prayed with me and gave a blessing, he looked at me and his words gave me profound peace. When I walked away all the pelvic and leg pain was numb , I knew God had touch me . After attending the healing mass, the trapped nerve has been ' shut down' all the pain is gone and after only 48 hrs I am off all the many pain pills I took every day. I praise God for my healing and my children will never forget our journey from ... Canada. Friends at home are all thanking God for this miracle. Great news! The Lord has healed Judy ... (cancer free) and Teresa, her sister, is also cancer free although her doctors want to be checking her every two months as the cancer was agressive. Praise the Lord! Please advise your prayer ministry in Rochester of this terrific news! Thank you all for keeping them in prayer." "I made a retreat last November and when to the mass you had at Fatima shrine in Holliston a few weeks ago. I have no sign of the pancreatic cancer since January of 2015. Praise the Lord." "I was reading Father McAlear book "Speaking from the Heart" when I gave up gambling. The two pages were The Cross and Surrender." "His work is so inspiring and helpful to get closer to our God. I find this booklet ("Come Stay Awhile") so helpful -- I can pick it up any time and it speaks to my heart - the last numbers of this booklet I have given to my friends (lay people) who have just loved it! Thank God - as they say "We can open it anywhere - anytime and it gets right to our hearts". "I want you to know what great consolation and peace of mind I experience when I read "Come Stay Awhile", "Speaking from the Heart", and "Tears". May your wonderful work continue." Thank you so much for writing those very special books: "Speaking From the Heart", "Tears", and "Come Stay Awhile" which a very special friend gave to me. As my health is not good, I can pick them up anytime at any page and it gives you so much to think about. May God bless you in your wonderful work." Thank you and God bless you for your long and faithful and blessed ministry. May God and Our Blessed Mother keep you always near to their Hearts. At the Fatima Shrine in Holliston on June 17, God touched my spine in such an awesome way that I want to give testimony of this grace and thank you. Kristen came to my assistance after your prayer and urged me to write to you - but at that moment I did not know what had happened or what I could say. The Charismatic Community was my spiritual home in the 1980’s, but I do not attend healing services as regularly now, so when I went up for prayer, I forgot about my spine; I was simply trying to surrender myself to God and asking Him to “change my compulsiveness to true love” as a Scripture of the Mass had prompted me. But as soon as I began to fall backwards, pain shot through my spine and I realized my back was out of control. As five people helped me to the floor assuring me that I would be alright, I kept saying: “I should never go to a Healing Service again…..” Only days later did I realize that I had been terrified that my spine would be fractured. Minimal movement of it has become almost second nature to me … but God touched it, it was not fractured, and it is somehow better because pain that I have just come to accept is lessened. I am 77 years old and have a scoliosis that I was born with and is now severe. When I first had MRI’s of it in the 1990’s, the neurosurgeon who looked at them was stunned and said he had “never seen anything like this in [his] life”. He sent me to Boston’s best adult scoliosis specialist who told me ”Do not ever let anyone take a knife to your spine because ALL of your muscles and nerves are so pulled out of place to compensate for the curvature that your spine would collapse like a stack of dominoes”. The curvature and twisting has advanced since then, and severe arthritic changes now also complicate the picture. It is something I just live with; in the 37 years that I have been going to Healing Services, it never occurred to me to ask God to heal it because I have been so needy of inner spiritual and emotional healing …. epilepsy since I was 10 and my own sins and failures have been the main things I brought to God, and also my family when Father John Lazanski taught us about intergenerational healing. But God touched my spine at your Healing Service. Kristen said to write you about what I poured out to her: that on this day - June 24 - in 1997, in Ireland a Mass of intergenerational healing was offered for my family. The woman who had a special ministry in this area saw in prayer through the Spirit a man four generations before me who was hit on the head while working in the peat fields and suffered seizures until he died. After the Consecration of the Mass, Mary saw him again. She, Father Paddy, and I each prayed for forgiveness, and after Holy Communion - Mary saw Our Blessed Mother join us. My uncle’s gown was changed from grey to white, his head was lifted up, and Mary led him to the Jordan River. The lesson explained to me from this is that sometimes people can die UNABLE TO RECEIVE the grace God wants to give them; Father had mentioned before Mass that sometimes people can die in anger. Later, I realized that we can also LIVE in anger and LIVE with blockages to the grace God wants to give us. In Medjugorje in 1989, my gift had been a peace I had never experienced and a promise that I would be “emptied” when I got home. When I came home, I became aware of a “blockage to peace WITHIN me”, which changed my life. God has kept my focus on my need for inner healing, but one’s spine is also very inner …. Lately, I have been trying to tell my physicians that “epilepsy is not a problem; my spine is my biggest problem”. I do not have any seizures, its medication has been my greatest problem and this is now much more reasonable, and my inner life is transformed. My spine is what could cripple me but I never even thought to pray for its healing, and was terrified when God DID touch it. God has shown me that my faith needs to grow and be open to new areas. I do not know what has changed, but something has changed because I have less pain and more freedom of movement. I am trying to CARE FOR the healing that God has given by exercising more faithfully, and a friend told me to just keep THANKING Jesus. I would also like to tell you that today belong to a Rosary cenacle of the Marian Movement of Priests. When we met today, one of our group had with her a small Crucifix from Medjugorje that she said had been “blessed for healing by Father McAlear”. She did not know you; a friend had given her the Crucifix. After we pray the Rosary and accompanying prayers, we pray for one another and our intentions in a small circle. Today, we all prayed holding that little Crucifix and then Marilyn prayed for each of us, blessing us with it. We were all greatly blessed by the Holy Spirit. Father McAlear, that Crucifix is a instrument of great grace and anyone to whom you give these blessed items is a truly blessed recipient. Your book of Seven Biblical Portraits” - including Longinus - gives an e-mail address to make a prayer request. As I send this testimony and thankfulness to that e-mail address, on these Feast Days of John the Baptist and Our Blessed Mother in Medjugorje, I commend my heart and my family to your prayer that I may be obedient to the Holy Spirit and be a woman of love and prayer." "I wrote to you in April asking you for your prayer as I have bowel cancer that had spread to the liver. I am the 34 year old Austrian woman who lives in in London. I wanted to thank you for your prayer to our Lord again and tell you that I had my first scan since starting chemotherapy. My tumours shrank by half after only four to five treatments. My oncologist was also impressed with the response. They at first always talked to me about luck (in relation to recovery and response) I know it has nothing to do with luck! And I believe that God is healing me." Its been 1 1/2 and Elma's has not felt the need to return (other then normal checkup) to the applicable doctors. God has blessed her with health. Thank you for your prayers." "I want to share something with you. I was baptized as an infant. I have always been a "seeker of truth" and followed several different gurus over the years. God has always been important to me, but I was dealing with a great deal of confusion. After listening to the teachings posted on your web site, I had the profound realization that Jesus Christ is my guru. I was only confused because I kept looking elsewhere. I was touched by your words and rediscovered the truth that I always knew in my heart. Thank you for your ministry." "You're likely busy and have a ton of emails so suffice it to say that I was near dead, and on retreat He started my heart again. Since then I've become more alive and free than I ever dreamt possible. What a Lover we have! Thank you for your part in my new life!!" "I want to first thank God for your ministry and all that you do, and in touching the lives of others. I remember when I first met you in Sydney 10 yrs ago. As I came up for prayer I waited in line for a blessing. When you reached me I looked into your eyes and saw the eyes of Jesus. I cried so much. Whatever was in my heart was healed." I have another story for you. The lady from St. Joseph that got a healing the 1st time you came here, that made it in the book, tracked me down after Mass this morning. She wanted you to know that when you prayed over her this time, and she went down, that she smelled the most beautiful aroma. She said she had it all the way home. She said she had been to the doctor prior to you coming, and they found blood in her abdomen, and her kidneys, and could not find where the bleeding was coming from. She was scheduled for another CT Scan a couple days after the healing Mass. she said God had already given her a miracle 5 years ago when you were here., and she did not expect another one. Well, she got one. The CT Scan was completely clear, no bleeding. The doctor said he could not explain it, and she said she told him that she could. She told him what had happened. I am so happy for her." Just wanted to tell you that the lady from St. Catherine's called me and said she had a story for me. At the Healing service on Wednesday night a lady that had a brain tumor removed in 2009, was attached to the sinus cavity. She had no reoccurrence of the cancer since then. After her surgeries she could no longer smell. When she came up to get prayed over, she said she had prayed for all kinds of things. After you prayed over her, she smelled a strong perfume, then she realized she could smell. She did not pray for this, but this is the gift she received." I wanted to thank you for coming to St. Pius X church in Rochester, NY in October of this year, a wonderful event happened to me, I have Parkinson's Disease and after the blessing I could feel a change happening. My shaking was not as pronounced. Over the next while it kept decreasing and has been almost nonexistent since then. On my way to the altar for the blessing I asked God for some relief and through you I feel he has granted me some relief. No one knows for how long but I thank and praise God evert moment of every day for what He has done for me for however long. Thank you for facilitating. I will continue to give praise and glorify to God as I will prayer for you Father." "My husband, John, and I were married on May 1, 1999 and we began trying for a family right away. John’s father, …, had been diagnosed with terminal cancer, and we desperately wanted him to meet his first grandchild. By May of 2000 and no pregnancy, we visited a fertility specialist and began undergoing many painful tests to find out why I wasn’t getting pregnant. Meanwhile, we continued our prayers for a healthy baby, and for Dad’s healing. By 2002, I was falling into deep depression, and I was desperate for a child. We were blessed by Father … at … to pursue fertility treatments that still allowed us to conceive the baby naturally, meaning no In Vitro Fertilization. We began fertility treatments in April of 2002. During this time, my father-in-law was still battling his cancer, but he was entering the final phases of his fight. Over the next 6 months I underwent treatments of Clomid with artificial insemination and HCG trigger shots to maximize our chances at conceiving. It was painful and emotionally draining. We had 5 failed cycles of treatment, and gave it one last attempt in September of 2002. Because of the physical and emotional toll it was taking on both of us, we decided we could not go any further if our last cycle failed. On September 20 of that year we discovered that our cycle had failed again. We were told that it would be impossible for me to conceive a baby on my own without In Vitro Fertilization. We walked out of the fertility clinic bruised, battered, and utterly broken. Around the same time that fall, we discovered that my father-in-law had multiple lesions on his brain and there was nothing more they could do for him. They gave him 8-12 weeks at the most, and much of that he would no longer be himself. I was having a major crisis of faith, and thought of walking away from the church, when my father-in-law invited us to a healing mass at … that you were presiding over. I agreed only because he jokingly said that I had to go with him because it was his dying wish. We were extremely close, he was more a father to me than my own biological father, so it was killing me inside that this dear man of such strong faith in Jesus was dying such a painful death. At the healing mass on October 9, 2002, we sat near the front, and when the blessings began, people were falling to the ground after being blessed. I remember being so irritated because I only saw this stuff on TV. Dad was trying to explain to me about the power of the Holy Spirit and the power of faith. He asked me to go up and get a blessing, and I refused. I told him that I did not believe in this stuff, that this kind of stuff was for crazy people. I also told him that I would only believe if I saw him healed of his cancer that night. I was just in such a low place at that time, I remember just being so angry. Again, he told me that it was his dying wish to see me get a blessing from you. I very reluctantly went up and received my blessing. I walked away and sat down feeling…..nothing. Half of me expected to see this bright light and feel all warm and tingly inside. I felt nothing, which made me even more angry and doubtful. We left mass that night, and I didn’t give it another thought. The only thing on my mind was how we were going to get on without Dad. A few weeks had gone by, and John and I had plans to meet up with my family in …. We abruptly cancelled our plans because of the DC sniper attacks that were happening. We were too nervous. We took vacation time from work anyway and just stayed home and did updates around our house. I remember this day as if it was yesterday. John was outside washing the car and I was in the upstairs bathroom cleaning. I felt this sudden wave of dizziness and nausea. I had never felt like that before. I thought that maybe my body was still adjusting from not being on fertility medicines, but the nausea just wouldn’t go away. I realized I missed my cycle. I had an extra pregnancy test from my time of trying to conceive, so I took one. I still get a lump in my throat to this day when I think about looking down at that test and seeing two blue lines. I thought I made a mistake and took another one, it came back positive again. I was stunned. I told John immediately, and he wouldn’t believe it either. We went to the doctor that afternoon and it was confirmed, I was having a baby. The day was October 29, 2002, almost exactly 3 weeks to the day that I received my blessing from you. We were able to share the news with my father-in-law, and he was able to give us blessing before he started losing his memories and his functions. He passed away on January 2, 2003, and we welcomed our first born son, …, on July 3, 2003. When our son was 10 months old, we discovered we were pregnant again. When our second son, …, was 11 months old, we found out we were pregnant with our daughter, …. After welcoming our third child in three years, my husband wanted to visit you again to see if you could remove the hex you put on us. I wish you could hear my sarcasm. It’s hard when you are reading text. We love to laugh about it! We are now a family of six, we welcomed a second daughter, …, in March of 2011. We would be so honored to introduce to our beautiful gifts from God, our gifts that God Blessed us with through your hands." response - I thought it was pretty good. I just pray!! think of buy your books. God Bless YOU"
that momement I knew I was forgiven and that Jesus loved me. bottom of my heart and for the MIRACLES you have given me." dropped from 168 to 95! Thank you God"
and quit), I decided I should at least get a blessing, so I stuck it out. the Holy Trinity and to the saints who have been passing on my prayers." very pleased. I would like you to keep her in your prayers..."
advance of your arrival about his mom who had been recently diagnosed. this Monday, June 20 that her bone marrow is completely cancer free. him that night. They are very grateful, to say the least." story of her own healing at one of Fr. McAlear's Healing Masses. the "staged" ones done by TV Evangelists that us kids used to joke about. a strong feeling, almost an urgency, to attend one of the Masses. begin to explain. Time stood still and I was with Jesus. hard but I was able to tell him that I needed "everything healed,"
rubbed the oil on my forehead, I saw and felt Jesus Christ through him. hopeful that everything was going to be alright. full of Jesus' abiding love. allowing God to use you." fastball , thank you a thousand times ." went the way of other disappearing posts? his symptoms to the doctor. And he was off charts behaviorally. Beeping. nine year old boy ingest a toxin? never been as bad as they were a few years ago. headed to ... in the next town over for another healing mass. Same priest. to him, "Do you know what you have to do now?" Son #1 replied, "No, what?" and he responded, "Get a haircut." Yes Grannie, you have an ally in the Catholic church. " "I just want to take a minute to relate my own healing experience. to 4 months to live. promised her prayers and those of the parish. blessing as well. You could say I was in dire straights! and sat with me and gave me some reassurance. stepped in with frequent hospital visits, communions, good jokes from Fr. grateful and EVERY DAY IS A GIFT." intercession and she was so grateful and amazed." wondering what had just happened!?? want to smoke. What a Miracle. only through His grace that I was cured. right side pressing on her brain and it had come through her ear canal. the Holy Spirit once again. Thank you Fr. McAlear." you do remember this I hope you do not think I was being disrespectful. soul. I have been struggling with sadness, “forgiveness,” and guilt. immediately tried to implement the teaching and right away I felt better. Mass which was in ... It would be a 2 hour drive. that Jesus would be present and things would be OK.
encouragement. I did go up to be blessed. left thru a back door in tears. love of God behind each love-touch commended in a healing! force our faith higher, we might somehow 'qualify' if we were good enough. to God's love, mercy, and goodness, and just receive it as a gift. I was missing the mark by falling short of comprehending God's love!! begun to receive the revelation of God's love. different experience and level of knowing. With that, I thank you, Father. ..."
"Dear Fr, Thank you so very much for being an instrument of God's love. your beautiful smile felt as though it was the smile of Jesus. Praise to God for his blessings and praise God for your faithfulness." harder since marrying my wife 6 years ago. I felt that joy physically touch me. I have never written these words before, but God bless you Father. "I recently attended two healing Masses and a retreat with Fr. McAlear. Mass with Father a few days later. began to appear almost exciting. I felt strangely pulled to forgive. felt a strong momentum toward forgiveness. pray, I feel enveloped in Jesus' love. maybe the same problems would have returned to me later. too many to list here, including this weekend at the retreat. " to be open, that He (God) knows exactly what He is doing. said "body of Christ, gorgeous" she lit up like a Christmas tree. looking kid she was very much at peace. Thank you. are Jesus! I was fearful to look on the face of Jesus so I closed my eyes. a dog gone thing bothered me and has not since. with her father is much better. Thank you Jesus! intimate relationship with Jesus, thank you for leading the way. May God continue to bless you and your wonderful healing ministry. Godspeed with all of your endeavors. With Love and prayers, "
removal of my thyroid for February 15th. thyroid doctor and requested another ultrasound before the surgery. smaller than it was in December but it's smaller than it ever was before. a result, she said I no longer need the surgery. Praise God! you, I would be undergoing surgery tomorrow. removal of my gallbladder in upcoming months due to gallstones. day, she has never had pain again. "Dear Fr. McAlear, Merry Christmas and thank you for your prayers. depression is much better now. I really would like to thank Fr. Richard McAlear for blessing me through the Holy Spirit. week, and my pain was gone and my general health and vigor is excellent. at St. Patrick's two years ago. Sincerely yours..."
wonderful. I posted it on faceblook and my space to my family and friends. you know what? My eyes have LIFE in them again! for......Him! He really is there and loves me and I love him." to know, that through your intercession Jesus has healed me from hernia. more pain nor problems with hernia. Thank you Jesus and Thank you Fr. Savior during the reading of those prayers. ESPECIALLY for "Speaking from the Heart"
went to your mass yesterday at ... and received a deep spiritual healing. such a love for him now." prayers. She loves you, you know this I am sure. somewhere just for her, she is eager to serve. that daily Mass rewards me. never understand…An absolute miracle in my eyes and my heart !! 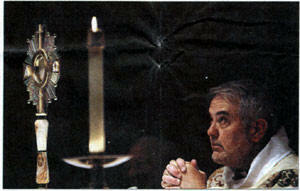 through Jesus in the Blessed Sacrament." me to heal and be well. Thank you Lord, I've been away too long." balance, her speech and she feels very light headed and groggy everyday. today. Thanks be to our Almighty God. " God's healing for myself and family." of chemo and radiation to further kill the cancer cells. grace of GOD will not protect me”. " I have been dealing with the pain. you do for people all over the world." you came the more I cryed. the eyes of GOD, I thank him that I could be in your presents. a long time and very hard. for me. Godd bless you and all the wonderful work you do. sign of tourettes and he really did have it bad...God is Good!!!!!!!!!!!!" much for taking the time that day and offering your prayers." Gods love and ours thank you." healing, we thank God for blessing you and sending you to us." Father's health and safety in his travels." people to turn to.... I was at my end. before. My parish in ... was holding one and I felt we needed to attend. was happening or what we had to do. So we went up together, holding hands. where I found my daughter looking rather glowing. Thank you, we are so at peace and our love for the Lord has grown." a loss to understand how I can be so different than I was yesterday. in the time of my life when I needed it the most." medicine and eventually she will get off of it. We are truly blessed. improved. I truly felt the Lord's presence working through you." the impact your prayers had on him. all the ways you serve Him each day." for cancer. Thank you for all of your prayers." in your system. It is as though someone laid hands on you." Kathy has been Strep B free since that time." cure for my child, but she felt peaceful for the first time in her life. and may God Bless You." mentally and physically felt much better. they would rush the report and have the results to my doctor on Monday. your film and report and we are completely baffled." I asked them why. I took after I was anointed by Father McAlear, showed I had no cancer." "Thank-you so much for your prayers. They worked! God is so loving!" probably has 3 days, maybe a week or so to live. Well, from the way my sister spoke, our mother's prayers were answered. and I hope to attend one of your healing services in ...."
the power of prayer is truly amazing. obstruction clears itself. The other require surgery. to help me. Later that evening, my bowel obstruction cleared on its own. power of prayer was at work. Thanks be to God. And thank you Fr. McAlear, ... and to all who prayed for my rapid recovery." evening and still feel an overwhelming sense of "peace". Thank you again! work you do in HIS name... THANK YOU!!!!" Richard in 1998 in Brisbane." 22nd an operation was set up for November 5th. deep into my eyes and I felt that I was looking into the eyes of Jesus. bless me and I am so grateful." desire to know and serve the Lord. true faith and with great expectations to experience the love of God. Holy Spirit moving in the Sunday Services, and in my life as never before. Why would I want to return to the Catholic Church. Well, guess what? revolve around the Eucharist. So, onward and upward! may His Angels guard you day and night. " blessed and am incredibly thankful. " Fr. Mac and were so much more resigned. but he is alive. The family would love Fr. Mac to know all of this"
along ever since with no symptoms." of the healing I've waited so long for, and the miracle I've prayed for!" everyone was asking me what happened. My fiancé said my face was glowing. you touched my face was very soft. my prayers will be heard." feeling inside that I can't explain! I feel very calm and peaceful within. Lord for blessing you with his healing powers." healing, as I had been going through a very difficult time in my life. supposed to say or do when I got up there. moment and I felt an incredible pull to encounter Him again. and I left with an even stronger pull to return. So, I went to another of Fr. McAlear’s Healing Masses two days later. presence of Jesus right there and I opened my heart to Him. When Fr. later found out was one of Father’s helpers praying over me in tongues). presence, His love, His mercy, and His healing touch through Fr. McAlear's ministry. My life will never be the same. " that the Lord has chose to work miracles through you." such a gift to the church! I praise God for priests like you! afraid of it. I don't think it worked. I will always pray for you from now on!" and the healings she received. Jan 2006 she had surprise heart surgery. thanks to the prayers and love we received during the difficult times. .
could say is it is Gods grace. She really glows with Gods love. prayers and Gods grace and love. If you have a testimonial that you would like to share, please complete the below form. Please note, any testimonials added to the web site will not disclose your full name. Thank you for sharing your faith to help others.